The reign of Napoleon I was short but it gave a boost to the economy. Bonaparte surrounded himself with great architects and artisans. Décor was predominantly in the classical Greco-Roman or the Egyptian style and symmetry was emphasised. Wood was complemented by bronze inlays (palms and palm-leaves, rosettes, stars, laurel-wreaths). The style was austere, but not without splendour. Functional shapes, circles, squares and rectangles, were appropriate to the fashions in clothing. Chairs were heavy, with scarcely-curving backs. X-shaped folding stools reappeared. 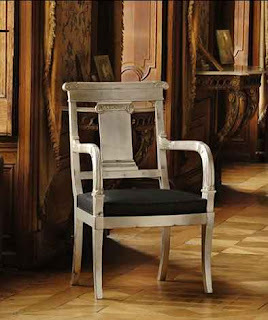 New designs included the gondola chair with its scrolled back ; the « Paumier » or chimney-corner chair, an angled armchair ; and the Récamier day-bed intended for resting. Georges Jacob and his descendants remained prominent, alongside Bellangé and Marcion. Sphinxes, gryphons, caryatids, lion-heads and dolphins evoked classical antiquity. Polished mahogany, picked out in gold leaf, was in use until the blockade of 1806 against England and the ban on the import of Central American woods. Springs made their first appearance in upholstery , which became very sophisticated. The silk-weaver’s art reached its peak. Fabrics were adorned with motifs suggesting the Empire (capital Ns, eagles, daggers,…).